Pure female power: that’s the Women in Black. Singing soft and tender ballads as well as rousing full-voiced numbers, the over 30 members of the chorus transport their audience to the vaudeville stage of the Roaring 1920s, guide them tongue-in-cheek through the Golden Age of German “Schlagermusik” and evergreen songs of the 1950s and 60s, dance under the glittering disco ball of the 1980s, and celebrate international pop and jazz hits. Their repertoire even includes highbrow chamber music – “with a twist”. Singing baritone in the internationally ranked barbershop quartet Latest Edition was not enough for Steve Hepner, vice principal of the John F. Kennedy School in Berlin. Having instituted a successful barbershop program for students at his high school, in 2008 he decided to keep spreading the barbershop gospel by founding a women’s chorus: Women in Black. As the founder and long-time director of the chorus, Steve used his exquisite combination of precision and enthusiasm to teach the new chorus how to produce the distinctive barbershop sound. His passion was so contagious that the Women in Black were soon infected. 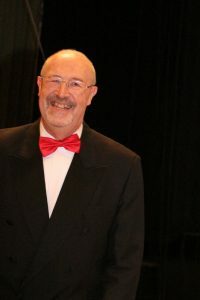 His singers entered into competition with other German choruses at the Barbershop Music Festival in 2012, 2014 and 2016, receiving the “Crescendo” award for the most improved chorus in 2014. Since Steve’s death in October 2017, the chorus’s captivating director Francis Schmutzler and her dedicated music team have been implementing his ideas and providing for a constant stream of new musical challenges in a variety of artistic genres. Barbershop is four-part a cappella vocal music, sometimes funny, sometimes sentimental, and always entertaining. The incomparable rhythms and harmonies produce a sound full of overtones and generate emotional goosebumps. The show is rounded out with snappy choreography and glamorous costumes: Entertainment for the eyes and ears! At the Barbershop Music Festival in 2014, the Women in Black received the “Crescendo” award for the chorus whose scores improved most since the previous competition.